This post stems from a fascinating post I spotted a while back on Treehugger. The topic was the Foreclosure Fish... a resultant reaction from the abandonment of homes, and more specifically swimming pools. "The mortgage crisis is not only wrecking peoples' lives, it's not doing much good for the environment, either. 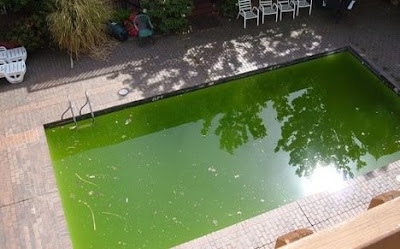 The swimming pools of abandoned homes are perfect mosquito breeding grounds, there are worries about rampant West Nile Virus infections. In California, authorities are using airplanes to find green pools and are filling them with the Gambusia affinis, or mosquito fish, which eats the larvae." Another in a long line of biological management strategies... the idea of these fish being able to escape into native waters is frightening. Again via Treehugger, re: the Gambusia affinis: "In Europe, the fish developed a taste for everything but mosquito larvae, and have displaced native fish. In Australia Gambusia caused extinctions of native fish and amphibians. In California they have decimated native species - yet civic authorities will give you a bag of them free if you have a mosquito problem. It may not seem risky putting them in a plastic and concrete pool, but the fish are champion escape artists, and can travel in as little as three millimeters of water." This technique is used in Oregon as well, with Gambusia affinis recommended, and even supplied for free to people with open water bodies. This comes in handy in localized pools and man-made ponds, but what about this scourge being unleashed on local lakes and rivers... and they're so cute. 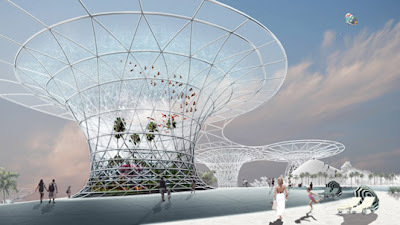 A variation of unnatural water... the innovative plant for providing drinking water to the Dead Sea area... via Inhabitat. "A research project from New York-based architect Phu Hoang Office seeks to address and solve these site specific issues with ‘No Man’s Land’, a series of artificial islands that would provide recreation, tourist attractions, renewable energy, and create fresh water. ... As a network of built islands with three distinct designs, ‘No Man’s Land’ would create an artificial archipaelago that employs a variety of building technology. In order to become a source of fresh water, the islands will extract water molecules from the air to be desalinated. 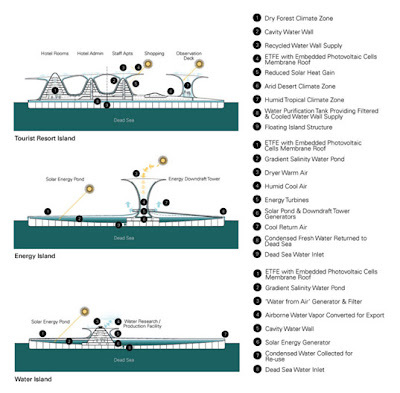 Salinity gradient solar ponds, water purification tanks, and water filtering processes will all be integrated into the designated “water islands” of the chain. The other two island designs will be for tourists and solar energy production, providing self sufficient power as well as creating revenue." Shifting gears a bit, to a more functional topic, that of stream restoration... or the unnatural recreation of nature. A New York Times article in June investigated some of the science of Stream restoration: "...scientists say 18th- and 19th-century dams and millponds, built by the thousands, altered the water flow in the region in a way not previously understood." While it is reported that over $1 billion per year is spent on stream restoration, this 'inexact' science often leads to failures. 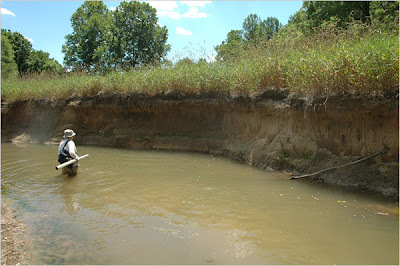 As William E. Dietrich, a geomorphologist at UC Berkeley mentions: "...an awful lot of stream restoration, if not the vast majority of it, has no empirical basis... it is being done intuitively, by looks, without strong evidence. The demand is in front of the knowledge.” The results, are often, sporadic. 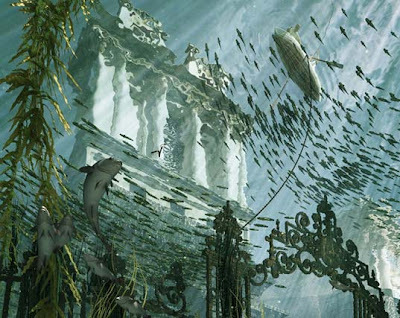 A final version of unnatural waters, a visionary post-apocalyptic view of London. Via Inhabitat: "As part of London Festival of Architecture 2008, award-winning media production studio Squint/Opera envisions London life in 2090, long after sea levels have risen from global warming. Imitating some of the techniques of the super-idealistic Victorian landscape painters, Squint/Opera have used a combination of photography, 3d modeling and digital manipulation to present five unique visions of a tranquil utopia in a familiar, yet drastically altered, landscape."